Proudly Serving Hinsdale, Western Springs, IL & Surrounding Chicago Suburbs Since 1958. Same Day Free Quotes! Haugland Brothers Carpet & Floor Care is full service floor surface cleaning company that takes great care to bring out the luster in your stone floor. Your Hinsdale home or business will glow when Haugland Brothers works wonders on your stone floors. Call Haugland Brothers today and set up a stone floor cleaning that will impress and awe. Our services cannot be beat when it comes to revitalizing stone flooring. 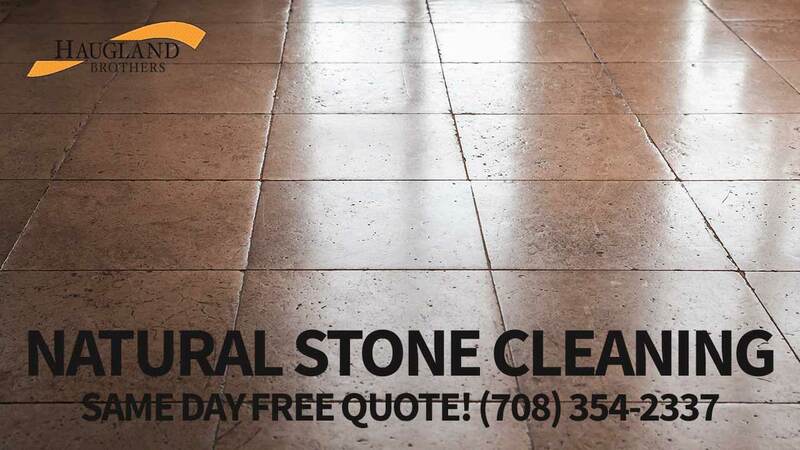 Our company is available for stone floor cleaning projects in Hinsdale and the surrounding area. With strong ties with a number of Chicago communities, we are proud to say that our company is the most trusted in the area. With a precise attention to the smallest details, our team of experts will make your stone floor look brand new. With Haugland Brothers you get a full service floor cleaning company that is equipped to carry out every phase in the process with precision. Our services include preparation of the area, deep cleaning, and adding protection to your stone floors. After a brief consultation on the state of your stone floors, you decide on the services that will bring out their natural beauty best. No matter how big or small, our goal with each service is to provide complete satisfaction to all of our customers. Sparkling Stone Floors From Baseboard to Baseboard! Haugland Brothers Carpet & Floor Care has the latest tools to bring out the best in your stone floors. With unparalleled performance from our products and machinery, our team of stone floor experts clean and restore stone floors. Not one inch of stone is left untouched as our sharp attention to detail cleans and shines every spot. Unique Solutions for Unique Stone Flooring! Natural stone flooring comes in different types and styles. We treat each project as needed, taking into consideration the state of the grout, the type of stone used, and the amount of traffic the area faces. We meticulously take care of grout stains, attend to any cracking or holes, and eliminate scuff stains on the surface of the stones. Why Should You Have Your Stone Floors Cleaned Professionally? When you choose stone flooring for your home or office, you are making an investment that adds tremendous value and lasting beauty to your space. This type of unique investment is appreciated by our experts, who will go to great lengths to ensure that your investment is always sparkling clean and meticulously maintained. Certain types of stone flooring products scratch and etch with ease. Even hard soled shoes will take away from the intended sheen. Plus, certain substances cause stubborn stains, not only on the stone, but on the grouting work as well. Our company can quickly remove etches, scratches and stains, and restore your stone floor to the same condition as when it was first installed. A professional stone floor cleaning will keep your home or business looking its absolute best. Stone flooring makes a bold first impression that you don’t want dulled by infrequent cleanings. With scheduled cleaning by a team of professionals, your stone floor will always make a lasting first impression. How Often Should You Have Your Stone Flooring Cleaned Professionally? How long you allow in between professional stone floor cleanings will depend on the type of stones you have and the amount of traffic they see. What you should always remember is that once you notice that the sheen is dulling, too much time has already elapsed. When Haugland Brothers comes out for their first time, we will carefully examine the individual stone floor pieces and the grout holding them in place. Together, we will decide the type of cleaning services that will best preserve the floors beauty and integrity, and how often they need to be applied. What Can You Do to Protect Your Stone Flooring in Between Professional Cleanings? Great care needs to be taken with all types of stone flooring to preserve its natural beauty and shine. Certain cleaning products contain chemicals that encourage dulling and etching, while others may damage the grout and break down the sealer. Once the sealer is broken down, the tile grout and stone become susceptible to permanent staining. Products that contain lemon, bleach, ammonia and vinegar often cause etching in the polish, discoloring the surface and scratching the surface. Other products may contain chemicals that are actually designed to break down minerals. These will cause noticeable streaking in the stone and deter from the beautiful look that your home or office deserves. Our staff will guide you towards the right cleaning products that will clean your stone tiles without causing any undue damage. Regular sweeping is also recommended to remove particles that may scratch at the surface. How important is Stone Floor Sealing? Stone flooring is installed piece by piece using a special tile grout or cement to hold the pieces in place. The sealant applied protects that tile grout from chipping while at the same time keeps particles from damaging the stone tiles. After a professional cleaning it is imperative that a new layer of sealant be applied to help retain the integrity and beauty in your stone floors. Bring back that shine in your stone floors by calling Haugland Brothers today! We are the most trusted stone floor cleaning company in Hinsdale and have the expertise required to handle such a valuable asset in your home or business.